Friendship Cards are a new educational tool thought to improve the lives of whoever makes use of them. The cards have been developed by Relationships are Forever Foundation, with the intention of helping children and youth develop their abilities to build strong relationships with their families, friends and others that they will come across during the course of their lives. This project will succeed if every one of us is prepared to offer some of his/her time to help others. Please make use of these cards and share them with your friends. Strong and happy friendships are based on trust, sharing emotions and different experiences. 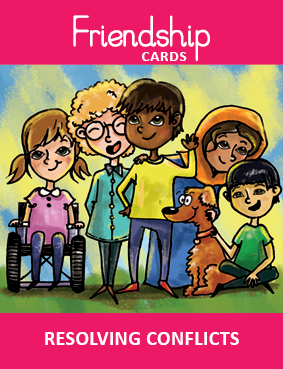 The first edition of Friendship Cards is focused on Resolving Conflicts …..
Focus on taking positive steps and avoiding hurtful behaviour so that you can make up and be good friends again.